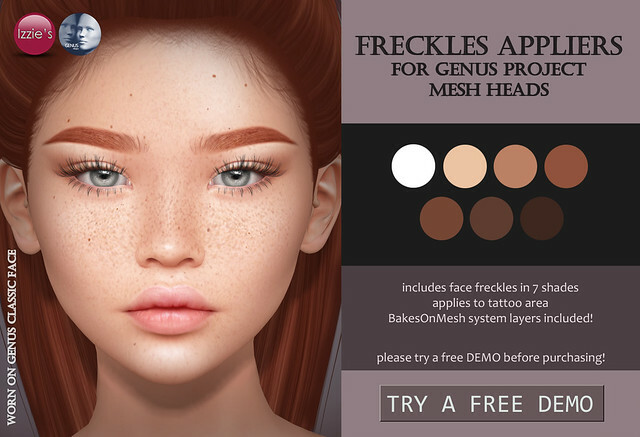 Izzie’s released Freckles, Eyebrow, Eyeliner and Lipgloss appliers for Genus Project mesh heads at the mainstore and on Marketplace. All sets include Genus appliers and BakesOnMesh system tattoo layers. Please try a free DEMO before purchasing to make sure they will work for your head/skin! 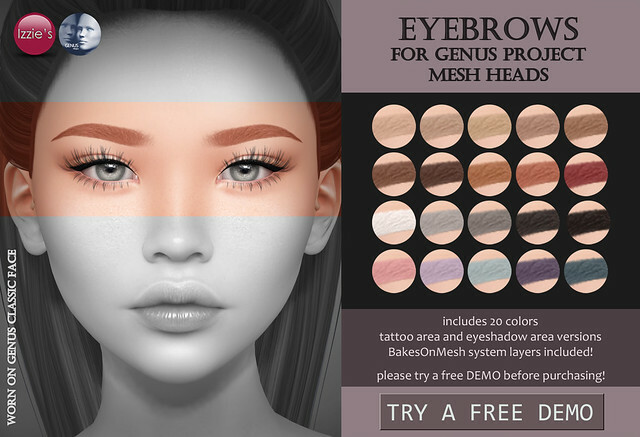 Izzie’s is offering 5 different eyebrow applier sets in 18 colors each for Catwa mesh heads at the current Uber round. You can choose from straight, soft arch, soft arch thin, curved and arched eyebrow styles. A full pack is available. The brows were made for Catwa Catya but will also work for other Catwa mesh heads. Please try free demos before purchasing, you can try them at Uber and also at Izzie’s mainstore. 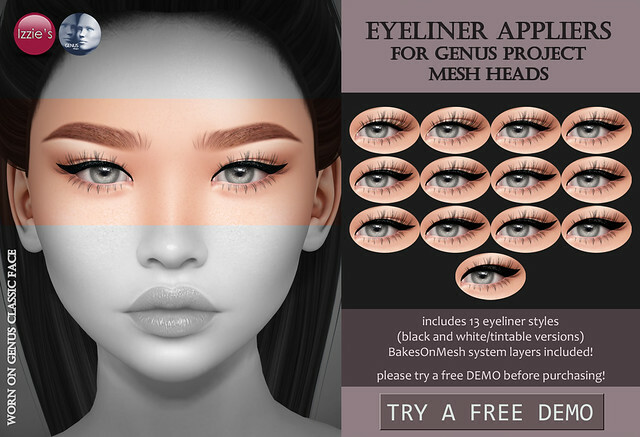 Izzie’s is offering 5 different eyebrow applier sets in 18 colors each for LeLutka mesh heads at the current Uber round. You can choose from upward, thin curved, straight, soft arch and curved eyebrow styles. A full pack is available. The brows were made for LeLutka Simone Bento but will also work for other LeLutka mesh heads. 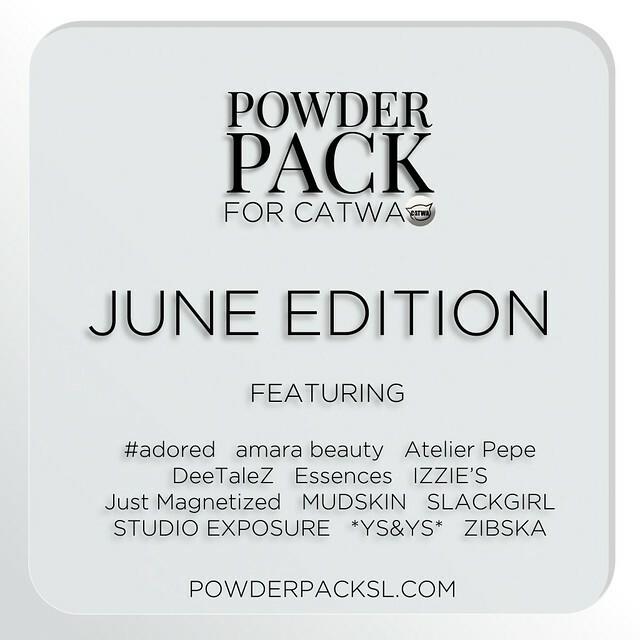 The Powder Pack Catwa June Edition is released and pre-orders are closed! 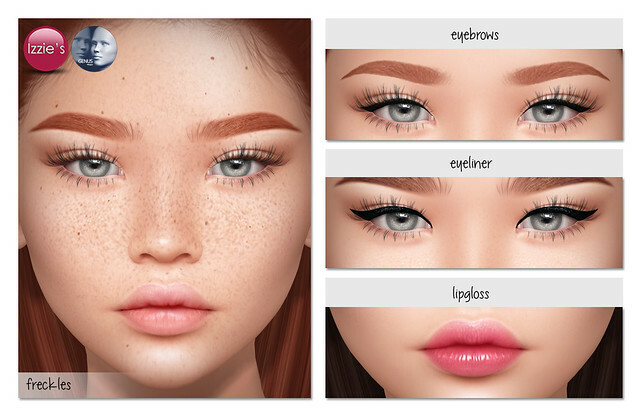 You’ll get a set of Eyebrows and Eyelashes from Izzie’s and many other makeup and skin appliers sets from 11 other brands (see pic below). Izzie’s is offering Vintage Summer Brows for Catwa and LeLutka Bento mesh heads at the TLC “Vintage Summer” round. You can choose from Naturals (20 colors) and Colors sets (19 colors), all will apply to the brows area of the Catwa and LeLutka heads. Please try a free demo before purchasing – there are demos at Izzie’s mainstore as well! Izzie’s released a set of eyebrows appliers for Catwa mesh heads and system tattoo layers for classic avatars at Izzie’s mainstore and on Marketplace. The Cora Eyebrows include 2 different eyebrow styles in 10 colors each (both the Catwa and system versions are tintable). To make sure they will work for you, please try a free DEMO before purchasing!